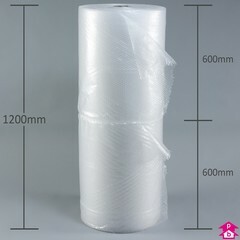 Bubble Wrap 600mm wide on 100 metre long roll. Small 10mm bubbles. 600mm wide on 100 metre long roll. Small 10mm bubbles. Clear bubble wrap with small bubbles of 10mm diameter. Available in batches of 2 x 600mm wide rolls.